The standard Meade LX200GPS microfocuser is not accurate enough for precision astrophotography. I had a RoboFocus that I used to operate the primary focus knob, but this precludes the use of the mirror lock. 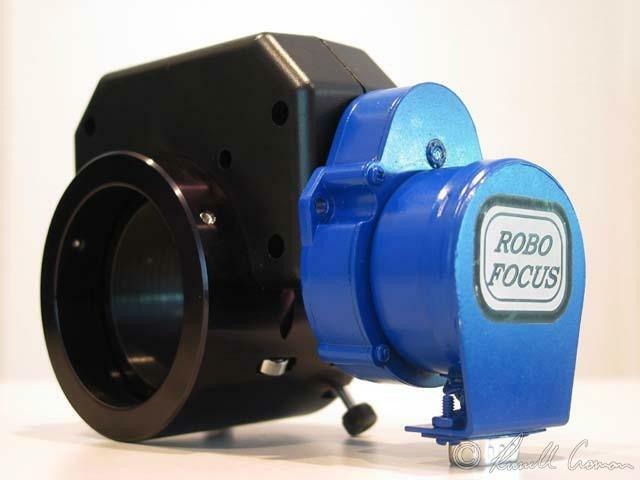 To get the best of both worlds, I mated the RoboFocus unit to the microfocuser. As you can see, this is a very clean system. It also works very well. The step size, using the minimum microstep setting on the RoboFocus, is approximately 7.5 microns. This is accurate enough for astrophotography down to at least f/2 focal ratio. The basic procedure for the modification follows. In addition to screwdrivers and a selection of tiny allen wrenches, you will need a drill motor and a 1/2" bit, a pair of pliers, some silver solder, and a small torch or sizeable soldering iron. Also, I did this with the LX200 version of the RoboFocus. I'm not sure how or if other versions will work. RoboFocus is available from Technical Innovations, Inc.
DISCLAIMER: Don't attempt this modification unless you are reasonably mechanically inclined. You are fully responsible for what happens to your RoboFocus, your microfocuser, and/or your person as a result of your attempt to make these modifications. Okay. With that out of the way, here is what the completed unit looks like with one half of the cover removed. Refer to this picture as you read the instructions. Remove the bottom bracket from the RoboFocus unit. This is the part that you normally sticky-tape to the rear cell of your scope. It is attached with two screws and nuts. Remove the sprocket. You will see that it is secured with a couple of pieces of wire that are soldered into a brass coupler on the output shaft. What I did was to break the wires off at the coupler and pull the sprocket off with pliers. You might have to work it a bit to get it off. 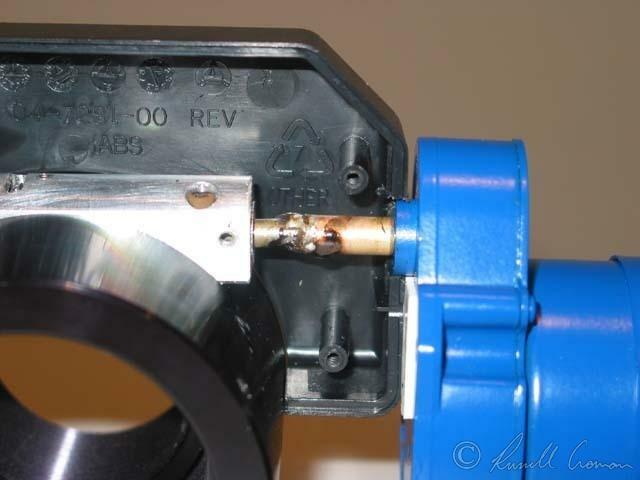 Heat up the brass coupler with the torch or soldering iron to melt the solder that holds in the remainders of the wires. Once the solder liquefies, turn the RoboFocus over and shake the solder out onto the floor (or something else that won't get damaged). Don't burn yourself. Note: I don't know if the gears in the RoboFocus gearbox are metal or nylon or what. To avoid melting anything, avoid heating things too much or for very long. You will notice that the coupler is slotted at the now-emptied end. With a screwdriver or similar prying-type tool, spread the ends open a bit. This is to allow insertion of the microfocuser shaft later. 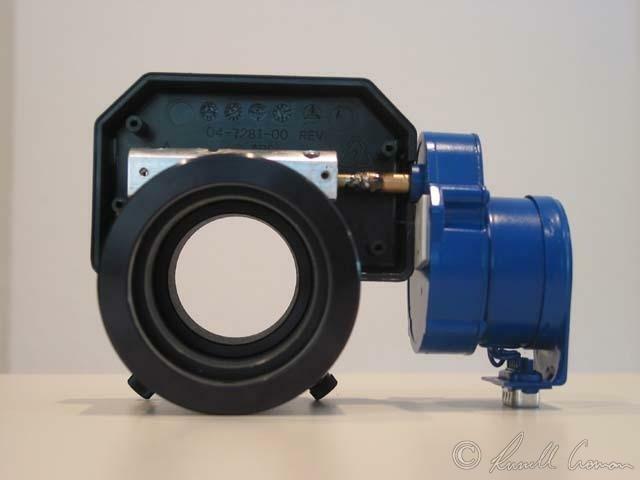 Remove the cover of the microfocuser. It is in two halves. The halves are joined to each other with four phillips-head screws, and each half is attached to the microfocuser itself with four allen bolts. Remove the gears from the two shafts by loosening the set screws in their collars. Remove the little aluminum bracket from the big aluminum piece. Note: don't remove the big aluminum piece from the microfocuser body. The big aluminum piece is pictured above and should stay put. The little aluminum bracket, that is to be removed, isn't pictured. You now need to drill a 1/2" hole in the microfocuser cover to accept the RoboFocus output shaft and the flange on its reduction box. The flange is what is almost 1/2"; the shaft itself is much narrower. To correctly position this hole, temporarily assemble one half of the microfocuser cover back onto the big aluminum piece, as in the picture above. Point the microfocuser shaft at your eye and figure out where the center of the hole should be. You will find that the hole mostly needs to be in one half-piece, but will extend slightly into the other half-piece. To drill the hole, I found it helpful to drill a smaller pilot hole at the desired center, screw the two plastic cover halves together, and then drill the hole to the final 1/2" size. Without breaking it, clamp the cover assembly while doing this, or the drill bit will grab when it breaks through and mess up your hole. Slide the coupler of the RoboFocus output shaft over the end of the microfocuser shaft. You may need to widen the end of the coupler and/or try different angles to get it to fit. Test out the positioning by seeing if the plastic cover will still fit with the RoboFocus in place. You may need to adjust how much of the microfocuser shaft is inside the brass coupler. You can see in the picture above that the flange on the Robofocus gearbox just protrudes into the hole in the cover. Make sure the two shafts are co-linear (i.e., straight). You don't want any binding when the RoboFocus tries to turn. Set the plastic cover halves aside so you don't melt them during the following step. Solder the coupler to the microfocuser shaft. When things have cooled down, check your alignment and positioning again. Re-heat and re-position as necessary. Somehow get a piece of sticky tape between the bottom of the RoboFocus gearbox and the plastic cover. You can see it in the picture above. It's a bit tricky to get it in there and get the RoboFocus positioned over it. See the first picture above for a final position reference. The way the microfocuser works, it is its own clutch; the shaft will slip on the inner tube if you try to drive it beyond its limits. I found that "in" on the RoboFocus is indeed "in" on the microfocuser, so I define the minimum RoboFocus setting to correspond to the max "in" position. Also, I noticed that the telescope tends to vibrate a bit after a move of the focuser, especially when a heavy camera is attached to it. This was causing the star images to be blurred a bit during autofocus. I think this happens because the RoboFocus starts and stops so abruptly. You can either enter a longer microstep pause to make the motion slower, or set a delay in your autofocus algorithm so it waits a couple of seconds after a focuser move (CCDSoft V5 has a setting for this). I did the latter and it seems to work well. Good luck! Feel free to email me if you have any questions.